Preheat the oven to 350°F. Bring a large pot of salted water to a boil. Oil a shallow 2-quart baking dish. Add the broccoli rabe to the boiling water and cook for 5 to 8 minutes, until almost tender. Remove with a strainer; leave the water boiling. Let the broccoli rabe cool slightly, then chop it into bite-size pieces. Add the pasta to the boiling water, stir well, and cook, stirring often, until almost but not quite al dente. Drain. Meanwhile, in a large bowl, beat the eggs with 1/2 cup of the grated cheese, a pinch of salt, and pepper to taste. Add the pasta and toss well. 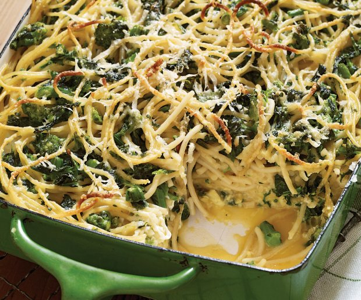 Add the broccoli rabe and toss again. Pour half of the mixture into the baking dish. Place the mozzarella on top. Add the remaining pasta. Sprinkle with the remaining 1/4 cup grated cheese. Bake for 25 to 30 minutes, or until the eggs are just set and the top is lightly browned.